This is Part Two of the How To Be Poor introduction. Read Part One and Part Three. In this introduction and in the coming series of How To Be Poor posts, you’ll find that I’m arguing for voluntary poverty, as opposed to voluntary simplicity. This is deliberate. I don’t advocate for voluntary simplicity, at least not in the way it’s commonly thought about, because it often deals in a very American middle class form of simplicity. That sort of simplicity isn’t necessarily about being poor or even using less energy and resources, but is much more rooted in a particular and popular myth I feel needs to be better addressed in our society. To get there, I want to talk about the last couple days. I arrived in Portland Friday evening, after a day of taking care of chickens, hauling wood and mucking out pig stalls, and my life has been anything but simple in the previous 24 hours. As is my tendency, I made some scattered and last minute plans with a variety of friends, trying to place different people in different time slots on a moment’s notice, texting and calling and changing plans, then changing them back, then coming up with something entirely different. It’s a ridiculous way to live, and I’m tired for it, and I want to take a nap except I feel I need to write a blog post and, in a few hours, I’m supposed to meet two friends at the bar. Throughout all of this, I’ve been spending money and utilizing complicated machinery at every turn: texting and calling a variety of people with my old and out of date cell phone that still is an intensely complicated and energy-heavy device; conducting that texting and calling over a massive, industrialized infrastructure; driving my car around town, often meeting people at the last minute, burning gasoline and taking advantage of a system of roadways that’s insanely subsidy-dependent, devouring incredible amounts of resources and energy; sitting in over-heated commercial buildings and drinking craft-brewed beer and micro-roasted coffee, all the product of energy-intensive processing systems and often using ingredients shipped from long distances; eating prepared, industrial food products that require, again, massive amounts of energy and resources, as well as the enslavement and abuse of animals and the degradation of human workers throughout the supply chain. I’ve been in town less than 24 hours, and I’ve already done all this, engaging these systems for my own comfort and pleasure and convenience. I and many of the people here in Portland understand the horror and unsustainability of these systems. They understand at an intellectual level that it’s a dead-end route, bringing misery and devastation with it wherever it establishes a presence. They’ve read the literature and heard the lectures and marched in the protests. They’ve chanted about the 99% and agitated against social injustice and bemoaned the easy destruction of our environment. And when I write “they,” I include myself in that designation, both as someone who is here in the city now and as someone who has lived here in years past and happily partaken in all these same devastating systems. Understanding the shortcomings and terrors of these systems, many of the people here advocate for and desire different systems. They don’t want to be a participant in these horrors and want, instead, alternatives to the dominant paradigm. Due to this collective yearning, Portland has come to be a city particularly adapt at telling a certain kind of story—a story that we hear often, from a variety of well-meaning people and a variety of politicians who may or may not be well-meaning, but are almost certainly self-serving. I think of this as the myth of the sustainable middle class, and I’m well versed in the story. This is a fine, compelling, and horribly destructive story. It’s a story that provides ease of mind to every one of us who has a weakness for all the comforts that the dominant system provides us while simultaneously tearing apart our planet and normalizing cruelty toward billions of humans and non-human creatures alike. This story—this myth—is dangerous because, while it provides the illusion of personal responsibility by telling us that we need a massive effort “along the lines of the Occupy movement” to elect a government that will provide us this utopian future, it ultimately absolves us of all responsibility for our current reality by assuring us that “we can avoid a world of global warming and economic collapse by building enough wind farms, solar panels, and geothermal systems to power our economy and ignite a sustainable, broad-based period of economic growth.” In other words, if we find ourselves facing an impoverished future of environmental devastation, catastrophic climate change, and dramatically reduced standards of living, and failing public health, it’s not because we dove full bore into the easy lives of massive overconsumption and resource depletion, but because we failed to elect the correct elites and thus were the victim of being denied our birthright—our outsized, yet still somehow sustainable existence of crass consumption, easy luxury and unending comfort. This is the sort of storytelling that keeps us from honestly addressing our very pressing problems. As long as we continue to think that we’re above this planet and its physical processes—that human ingenuity, a phrase I’m quite sick of, somehow places us outside of and unbeholden to the laws of physics—we’re going to look for and assume easy answers, and we’re going to suffer as a result. The sooner we realize that we are of this planet, a part of it, a species upon it like every other species upon it, and that we must work within the same natural and physical realities as these other species do, the sooner we can begin to live well and improve the outlook of our future. If we’re going to live sustainably, then that means living within the planet’s natural flows of energy and using the planet’s resources at a sustainable rate—and using a small enough percentage that the planet is still able to support the billions of other plants and animals that help make up the healthy and functioning ecosystems upon which we depend. That means using orders of magnitude less energy and resources than we do now, which means a wholesale change in the way the populations of industrialized nations live. This doesn’t mean building a huge infrastructure of solar panels and wind farms and geothermal systems and then using all that energy to pay the craftswoman down the street $20 an hour to make knick-knacks out of biodegradable, corn-based plastic and FSC-certified wood. That’s the absurd fantasy world of the sustainable middle class. A real sustainable world would mean that the populations of industrialized nations live much more like the populations of what we charmingly refer to as “third world” nations. It means living very basically, living poor, radically downsizing our lives and our resource and energy usage, and figuring out how to do that well. It can be done well and it can still provide a relatively comfortable and enjoyable life. The sooner we realize that and dedicate ourselves to the process of learning that, the better off we’ll all be. If, instead, we continue to tell ourselves stories about a magical, sustainable future in which we all have electric cars and the ability to travel vast distances in small amounts of time and for little money, we all have well-paying jobs in which we don’t actually create things of use, all the energy is there for the taking so long as we elect the proper government that’s willing to build the proper infrastructure, or that so long as our coffee is microroasted and our beer is microbrewed, our grocery stores are locally owned and stocked with industrially-produced but organic food, and that the new wing of the local co-op was made out of cob and recycled wine bottles, then we can continue to indulge in outsized luxury and comfort and everything will be fine—well, then, we’re going to dive as full bore into our future disaster as we have into careless energy and resource depletion. As fantastic as I think a building made out of cob and recycled wine bottles is, it’s not going to allow us to otherwise live our lives unchanged. That’s a bedtime story that’s putting us to sleep at the exact time we most need to be wide awake. This is the difference, in my mind, between voluntary poverty and voluntary simplicity. Voluntary simplicity seems very much to me a movement co-opted by the myth of the sustainable middle class. Poverty was not seen as particularly attractive, so instead it became simplicity. You can still buy your way to happiness, it’s just a slightly different happiness than what the mainstream prescribes. Voluntary poverty, on the other hand, is brutally honest. There’s no getting around the word poverty—it means less money, less energy, less resources. It means doing without and making do. It means you can’t buy your way out of your predicament, and that instead you have to learn how to live in a fundamentally different way. It means less comfort and luxury, and learning how to live well with that. Voluntary simplicity, in other words, is the electric car. Voluntary poverty is walking to where you need to go. Walking is honesty. The electric car is storytelling. That’s the difference, and it’s a critical one. When I wrote my post about Portland a couple months ago, that storytelling is what I was referring to. A big part of the reason I find it so frustrating is because I’ve believed that story. I’ve acted out that story, lived my life according to it. I’ve spent much of my life beholden to it, indulging in it, and I look back on that with a certain amount of chagrin. As frustrating as that can be for me, though, it also needs to be a source of education—an awareness which I use to push myself further into voluntary poverty, into what seems a more appropriate way of living. Every time I return to this city—this city that I really do, in many ways, love—I find myself slipping back into that story and the easy comforts it provides. I do this with a mix of awareness and abandon, sometimes with the personal understanding that I am allowing myself this comfort and that, while not benign or ideal, it is a reality I’m acquiescing to at that moment. However, that can’t be the end of the story. That in itself is a luxury and indulgence, and it can very easily become the same indulgence with which we entertain the myth of the sustainable middle class. At that point it becomes dangerous, self-defeating and a threat to a life well lived. This as well, then, is the context of my current work. And that is going to be much the context of this series of posts on voluntary poverty. I’m at the beginning of a very specific and personal journey. I think there are lessons I’ve already learned that will be helpful to others, and I suspect I’ll learn many more lessons that will be of further help. In part three of this introduction, I’ll talk more about my personal situation, my plans for the future, how I think that relates to my readers, and my specific plans for this series going forward. This is Part One of the How To Be Poor introduction. Read Part Two and Part Three. We face an uncertain future. I may sound like a broken recording in saying this again and again, but it’s true. We find ourselves having recently passed peak conventional oil, soon to pass peak liquids fuels, and facing down fast-approaching peaks of natural gas and coal. On top of that, we’re putting incredible strain on the environment, depleting the ancient aquifers that provide so much of our drinking and irrigation water, losing unimaginable quantities of top soil every year, destroying our forests, altering our climate, and helping to create a significant increase in the occurrence of extreme weather events. Considering that much of our national and global infrastructure—the sort of infrastructure that both supports seven billion people on this planet and also provides many of the comforts that we associate with an industrialized way of life—is intrinsically tied to various forms of geography that tend to be effected by major weather events (imagine roads, power lines and sewer lines all running along rivers, for instance) we are facing a present and increasingly-problematic future of degrading and crumbling infrastructure. We also are facing a future with far less available energy, far less available resources and far less money with which to rebuild that infrastructure, further complicating the scenario. That lack of energy, resources and money further means we can’t continue the dizzying economic growth that we have come to expect and depend upon for our way of life, and are thus facing necessary economic contraction. Such contraction will further lead to a dysfunctional and collapsing financial system. This is due to the fact that our financial system is based on debt and perpetual growth. Take away the perpetual growth and the debt can’t be serviced. Take away the availability of credit and the ability to pay back existing debt, and you have a financial system that ceases to function. Projects grind to a halt, jobs become scarce, unemployment rises, profits fall, tax receipts drop, governments take on more debt to keep the game going, social safety nets sag until they’re damn near touching the ground, austerity measures take root, and soon the entire complicated apparatus is teetering and citizens are falling by the wayside left and right. In other words, we’re facing a world of problems. More specifically, as John Michael Greer has argued, we are facing a predicament. Problems are in search of solutions, just waiting to be solved. Predicaments, on the other hand, are inconvenient realities we must learn to deal with. We’re dealing with the predicament of too little energy, resources and money to continue down the path we are on and therefore we are in need of new ways to live. This is a predicament, not a problem, because there’s simply no way that we are going to be able to find renewable sources of energy that can replace fossil fuels and allow us to continue our energy-intensive lifestyles. This, in other words, is our new reality. It is imperative we figure out effective ways to respond to it. Some might claim that a cabin in the woods, far away from other people and stocked with freeze-dried food, plenty of water, perhaps some seed packets, and boxes of ammunition is an effective way to respond to an uncertain future. That’s the wrong approach, however, for multiple reasons. First of all, we don’t likely face an apocalypse so much as we face contraction, tumult and lowered standards of living. Our predicament is not likely to lead to a sudden and complete collapse, as that’s not how societies have tended to collapse in the past. Instead, it will be long and drawn out, a stair step process of shocks to the system followed by stabilization, a stretch of relative calm but lowered standards of living, and then another shock to the system. This will happen over and over again until, eventually, we will find a few hundred years down the road—long after everyone reading this is dead—the final ruins not only of the American empire, but of the commonality of fossil-fueled, industrialized societies. Considering this scenario, the proper response is not the aforementioned cabin because we are not facing such a dire situation. We are facing, instead, the prospect of an increasingly poor and fragile society, rent by economic shocks, disintegrating infrastructure, food and energy shortages, the collapse of supply chains, the necessity for far more physical labor, much more local economies, and a general struggle to get by. The closest parallel in recent history, in other words, is probably the Great Depression. Society as we know it is not going to go away over night, but rather keep chugging along, in a highly dysfunctional state, as most all of us become much poorer and find day-to-day life more of a struggle. Communities will survive, though, and some will surely flourish. This is another reason why the cabin in the woods is not an effective response to our current and future decline. Community, not the individual, is the basic human unit of survival. Individual humans very rarely survive in complete isolation. We are social animals and we make our living at a community level, to some degree or another. We depend on others for many of our needs, even among the more self-sufficient of us. The ability to provide yourself everything you need to live a decent life, all on your own—or between, say, yourself and a partner and possibly a couple kids—is a pipe dream. It doesn’t exist. We need other people—people who care for us, with whom we share an interdependence, who understand the ways in which our fates are tied. We needs friends and family and acquaintances and even begrudging allies. We need a community, whatever form it takes. In a world lacking in energy, resources and money, however, the scope and composition of that community is going to be significantly different than it is today. Whereas today most of us depend on massive, globalized, industrialized supply chains to provide us most of our living, in the future we are going to have to relearn how to provide most of that on a very local level. Whereas today, we can always buy our survival so long as we have enough cash, the future promises a reality in which cash is much less valuable than skills and knowledge. Whereas today, we don’t have to resign ourselves to the messy workings of a community to guarantee our survival, so long as we have enough of the aforementioned money, the future promises to require quite a bit more communality from all of us, and to require that we deal with all the messiness and annoyance that can entail (as well as the joy, companionship and conviviality.) Whereas today, we can buy all the comfort we want so long as we have enough cash, the future promises a great deal less comfort for everyone, including those with abundant cash, and is going to reward those who both figure out how to create comfortable lives without money and those who redefine what comfort means in a way that requires less energy and resources. The future, in otherwise, is looking cash-poor. It will likely provide less comfort and far less material goods, but it will provide some comfort, perhaps even a significant amount, so long as we are capable of reevaluating what comfort means and have some idea of how to create it while working with local resources, within our local community, and without much money. That can be a challenge, and living well while being poor is something of an art and a skill. It is entirely possible, though, and it’s an art and a skill that we would do well to begin learning now. Most of us are either out of practice with these skills or never learned them in the first place. This is a result of the insanely rich and overabundant society that we live in and the loss of culture that it has demanded and entailed. Peering into our uncertain future, though, it seems clear we’re out of time. We must learn these skills now. There’s simply no more time to delay if we want to increase our chances of living a good life in the future, relatively rich with comfort and stability even if extremely poor in cash. This, then, is the core of my argument for voluntary poverty. If we are going to live in a world that necessitates we be poorer, then it makes perfect sense to learn how to live well in poverty now. However, there’s another important dimension to my advocacy—one that goes beyond the practical nature of my core argument. We also have a responsibility to scale back our lives. We live in a time of incredible, abundant energy and resources. We have a standard of living that is otherwise unknown throughout the history of humanity. As John Michael Greer noted in his latest writing over at The Archdruid Report, “A modern American climbing into the driver’s seat of a large SUV has more sheer physical energy under his direct control than your average Southern plantation owner had before the Civil War.” That is an incredible reality, and it’s a sobering one. The majority of Americans have access to a level of resources that is insane and unsustainable. This access is also murderous and destructive. We are tearing apart our planet in service of this outsized lifestyle. We are destroying many of our fellow creatures, engaging in a level of genocide that is unfathomable. At the same time, we’re enslaving other human beings, destroying communities, polluting drinking water and food supplies and devastating the livelihoods of billions of people in pursuit of this abundance—in our sense that it is fair and right for us to have this impossibly large share. We—all of us reading this, even if to varying degrees—are destroying our world and so many of those, human and otherwise, who live in it in a maddening pursuit of wealth and comfort and distraction far beyond what we need, far beyond what is fair, far beyond what is reasonable, and far beyond what will soon be realistic. If we’re to confront and recognize these facts—and rest assured that they are indeed facts—then we have the moral responsibility to begin the process of scaling back our lives, of impoverishing ourselves so that we may ultimately live better, so that others may live better, and so we may become reacquainted with an honest understanding of what it is to be human in this world. And again, this is not just a moral imperative, but a perfectly logical reaction to our times. When I say we must impoverish ourselves, I don’t mean we must make ourselves miserable. One of the problems we have is that we equate poverty with misery. While that certainly can be the case, it’s just as possible to exist comfortably in poverty and to live well with little money. It’s a challenge, yes, and it takes much work. It’s a long process. It’s a struggle. But that’s what this life is, after all. We’re not here just to party. We’re here to learn to live well. I don’t know what other point there is if it’s not that. Why else could we possibly be here if not to learn to live and work well? What else makes sense? The simple reality is that living poor is a much better way to live well in this world than is living rich. The lifestyle that many of us here in America and in other industrialized nations have come to view as common—that many of us have come to see as an entitlement, so long as we do the right things—is not living well in the world. It’s living destructively. It’s outsourcing our lives and destroying other people’s lives in the process. It’s taking without giving—receiving and returning it with a slap in the face. It is a cruelty, and we have to walk away from it. The good news is that to walk away from it doesn’t have to be a sacrifice. It can instead be incredibly rewarding and provide a return to a way of life meaningful and fulfilling, engaged and joyful. In Part Two of this introduction, I’ll talk about the potential rewards that await in a life of poverty and attempt to break down the middle class myth. This, admittedly, is more a product of avoidance than it is significant insight. Over the next week or two, I plan to finally roll out introductory posts (or in one case, a re-introductory post) for the four categories of posting that will be my main focus in this year. However, my introductory post to How To Be Poor may take a bit more focus than I have in the next few hours before I head up to Cannon Beach to visit a friend who’s in town. I wanted to post something today, though, so here are a few small thoughts I’ve had in the last 48 hours. The birds are out in force today. The snow we received earlier in the week has melted, the weather has turned to a combination of rain and warmth, and our little avian friends are exploring, with considerable spring in their hop. They’re all over the gardens, rooting around in both our bare and cover-cropped beds, no doubt searching out bugs and seed. This isn’t much of a surprise; I imagine they’re hungry after multiple days of snow-covered earth. All this rain, as well, has likely brought worms to the surface and unearthed quite a few other tasty morsels. It’s a real joy to watch them bounce around and explore. This is one of my favorite sights on the farm, of these winged creatures foraging. There is something mesmerizing about the behavior—and very gladdening of the heart. 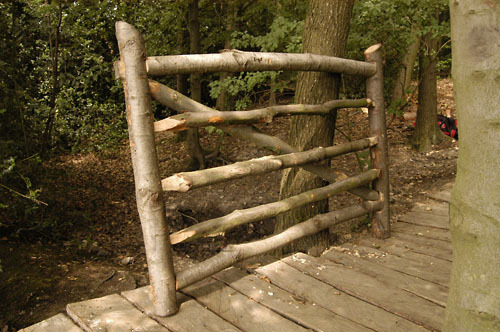 The approximate design of the gates I built on Thursday, with the difference being that mine were made of standard boards, rather than small, beautiful logs like this one. Also, I shamelessly stole this image from a blog post at idostuff.co.uk. Check them out. Over the course of the day, I made seven gates. I managed to get the process down quite well and really enjoyed the process of hammering endlessly at nails, marking the wood, buzzing the miter saw, watching the familiar shape take form. I have built few things in my life, not having grown up with much craftsmanship happening in our household and having worked retail jobs before starting to farm. I know this isn’t an original thought, but there is something very satisfying about constructing real, physical, useful items by hand. It feels productive in the best of ways. It feels like real, good work. And it is good, as the gates will prove useful tools, utilized in the service of raising healthy lambs and feeding the community. They were made with a mix of spare and low-cost materials and human labor—and they’re simple, attractive and functional. In an age when that often is not the case, I felt a real satisfaction crafting such tools. It also helped me to realize I can build things and I even, dare think, can be fairly good at it. Not that my gates are of any surpassing quality, but the basic skill seemed to be there. That left me thinking that, with much more experience, I might be able to become a solid builder. That is an eventual goal of mine. Last night, Ginger made a fantastic chili. Now, I’ve spent much of my life not being a fan of chili. I never hated it, but neither was a huge fan. My father made chili—good chili—and I did like that okay, but still was not in love with it. Then I became a vegetarian for something like twelve years, and let me just say that I am far less a fan of most vegetarian chilis. This is probably unsurprising given the fact that I don’t love beans. Ground beef, to me, was often the one saving grace of chili. Ginger, however, has since revealed to me the secret of making great chili, vegetarian or otherwise. It’s the use of pumpkin or winter squash. The first time she did this in my presence, she simply used canned pumpkin. Future times, she’s used our own winter squash. Let me just say that this makes all the difference—I have yet to taste a chili Ginger made I didn’t enjoy. Last night, however, she outdid herself, not only through the use of sweet meat winter squash, but also some fantastic green chilies from New Mexico, which she discovered buried in the freezer. The resulting dish was absolutely fantastic, just a beautiful melding of flavors. One way to heat up a wood stove quickly is to use small pieces of oak. I learned this recently from Brian. Due to his kayak-building business we often have small sticks of oak around that can be thrown into the fire. This creates a near-instantaneous heat boost, as oak is a hardwood and, accordingly, burns quite hot. I found myself today in the situation of needing to heat the stove quickly. Ginger had fired it up to reheat the aforementioned chili and we both wanted corn bread with it. I’ve been on a corn bread kick of late, making it left and right. When you have chili, you really should have corn bread, and we were missing it as we ate the chili last night. So today, the corn bread was a must. I delayed, though, and before long the chili was already hot, I hadn’t started the corn bread batter, and the stove’s oven chamber was only 150 degrees. What to do? Well, we waited and I got busy. I went out to the wood shed, scrounged up some sticks of oak, threw them into the fire, then started making the batter. Before long, the oak was crackling away in the wood stove and I had the batter ready to go. Into the quickly-heating oven went the cast iron skillet and about three tablespoons of butter. Once that had melted, I swirled it around in the skillet, coating the inside, poured the rest of the butter into the batter, mixed it, dumped the batter into the skillet, and put the whole thing back in the oven, which was now up to about 300 degrees, thanks in large part to the oak. Within a half hour, we had hot cornbread straight from the oven and hot chili that tasted even better than the night before. Outside, the rain fell and the birds hopped and inside, before long, Ginger and I both had contented bellies. A fine winter day, indeed. Yesterday I woke up feeling sad. I felt it as I made breakfast, preparing for a day of work with Lance and Tammi. Thoughts of the future preoccupied me and I couldn’t help but feel a small depression at the trying times I suspect we face. I am a firm believer that there is much good work to be done in response to this future and that much of that work will prove rewarding, enjoyable and renewing for us. I’m a firm believer that the way we live now is not ideal and that many of the ways in which we will be forced to change will be for our good. Yet, there’s no denying that if my vision of the future is correct, even in just a general sense, then we will have to deal with some harsh realities. Most of us here in America and other industrialized nations would do well to be poorer, yes, but we very possibly face an extreme poverty that will prove at times painful. That doesn’t mean a good life is impossible, but an easy one looks less and less likely. I see it already in the struggles that some of my friends are having with the economy. I see it in the fear of friends and acquaintances that their living may fall out from underneath them, leading to a frightening and uncertain future. I fear even for my family and friends who are secure now, because I believe none of us are particularly secure long term. Dwelling on these melancholic realities, a part of me wanted to crawl back into bed, to close my eyes and disavow everything I’ve been thinking of late. Instead, I went to work. In the morning, I moved and cared for the chickens, then pitchforked some cow patties. By the afternoon, I found myself repairing and restringing parts of a barbed wire fence. This fence runs along a sporadically busy country road and encloses a field within the Miami River valley. It’s a particularly beautiful valley—abundantly green, blue skies overhead that day, forested hills rising on either side, veined not just with the river but multiple meandering creeks. I felt lucky to be there, to have good and simple work in a beautiful setting, to be able to work at a natural pace. My earlier melancholy couldn’t hold in such a satisfying moment. Tammi joined me a bit later and we finished that stretch of fence together. Afterward, we drove back to Nehalem—Lance, Tammi, and their daughter Abigail in their truck, I in my own car—to a barn where they keep some more animals. We were there for two baby goats, born sometime within the last two days. After a quick bit of herding, we had the mother and her kids separated and ready to be transported back to the main farm. We loaded the mother in the back of the truck and Abigail and I each held one of the baby goats for a few minutes, marveling at how light they were, how cute and plaintive. They seemed weak, possibly not yet fed, and we worried the mother had rejected them. But even in that sobering situation, I couldn’t help but be buoyed by the tiny, adorable creatures and their small warmth. This was one more of the many, many perks of being a farmer. From there, Lance, Tammi and Abigail headed back to the farm with the goats and I drove back to my farm, the work day done. At home, I used the bathroom and washed my hands, glorying in the warm water on my cold flesh. It was a small but significant pleasure, and it’s the sort of pleasure that I think will play a much large role in our lives in the future. I drank two beers, ate dinner (lamb burgers), poked around on the internet, talked a bit with Brian, read the last few pages of Depletion and Abundance, including the quote at the beginning of this post. I felt sad again, and I’ve little doubt that the beer played its role in that. For all my declarative statements, I don’t know what will happen in the future. I suspect poverty. I suspect a hard go of it. But we have a hard go of it now. We’re tearing apart the world, doing our level best to murder our ecosystems, losing much of our humanity in technology, fracturing our communities, our families, our covenantal relationships, distracting ourselves constantly, enslaving ourselves to an economy of degradation. We don’t do good work for the most part. Many of us struggle to find meaning. We feel at a loss, adrift, often alienated, cut off from living a life that feels full and real. Hot water on your hands becomes a pleasure when you’ve been outside for much of a winter day, becoming cold at times while you do important work, leading a more immediate life. When you’re inside all day in a climate controlled environment, cut off from the actual, outside world, perhaps distracting yourself with television and the internet and a variety of electronic gadgets, or maybe just doing work that doesn’t do much to enrich your community—well, then hot water tends to be standard, expected, nothing wonderful or revelatory. I like hot water being revelatory. Yes, it means less comfort, but then you actually recognize when you’re comfortable. And the times when you’re not are much more likely to involve good work and meaning. So, yes, I become depressed sometimes when I think about a future I don’t expect to be pretty. But then I have moments when I’m working outside, repairing a broken fence. Or holding a baby goat, not more than two days old. Or simply running hot water over my cold hands and sighing with relief. These are all things that are as likely as not to occur during a life of poverty and they all give me joy. Sometimes, that joy exists only because of this different life. And I think about all the things that have depressed me in my previous life—the lack of meaning, the constant distraction, the multitude of electronic gadgets, the destruction of ecosystems—and I hope and suspect that will be much less a part of our future as they are now less a part of my present. I fear the pain and challenge I think the future presents for all of us, but I celebrate all the joyous moments and sense of meaning it promises to bring, as well. Yesterday morning, I could have let the fear grab hold of me, crawled back into my warm bed, closed my eyes, pretended it all away, shirked my responsibilities, ignored the good work waiting for me and impoverished my future—and it would have been the easiest thing to do at that early morning moment, when I wanted no part of my visions of the future. But I went to work instead, and there I found joy and happiness and meaning. By going forward, I found a small bit of the antidote to my fear. Every day doing good work will bring more of it. To turn away from that and try to return to the false comforts of our current way of life would have been an abdication of responsibility and a personal condemnation to a life less meaningful, less happy, filled with delusion and sorrow rather than the sometimes hard joys of good work. This, then, is why I go forward into voluntary poverty. Because I think it’s important work, because I think it’s my responsibility, because I can’t bear the standard world around me, because I don’t believe it will bring me happiness and joy. If I find myself living in a world in which I rarely notice and appreciate the hot water on my hands, I’m living in the wrong world. This world, this poorer one, is the right one. It’s the only one that can bring me happiness and meaning and satisfaction. It’s the only one I can bear. So I go forward, into poverty, into good work, gathering my antidote piece by piece, a lifetime of work.